Welcome to the 3rd issue of Electronics Project and Design Newsletter. We know this 3rd newsletter is slow in coming to you and we would like to thank you for being so patient. We have been busy updating the website with many new projects and relevant information pertaining to electronics project design. If you have not visited the site for quite a while, do pay a visit now and check out the new projects recently uploaded. We will feature two projects that uses the LM3914 IC to enhance your understanding of this particular device. The other update we would like to share with you is that we have recently launched our own electronics store where you can purchase electronic components, DIY kits, tools and gadgets from the comfort of your home. This LED thermometer project uses a standard precision LM34 temperature sensor that has a linear voltage output based on the room temperature in Fahrenheit. If you want to display the temperature in Celcius, you can use the LM35 temperature sensor. 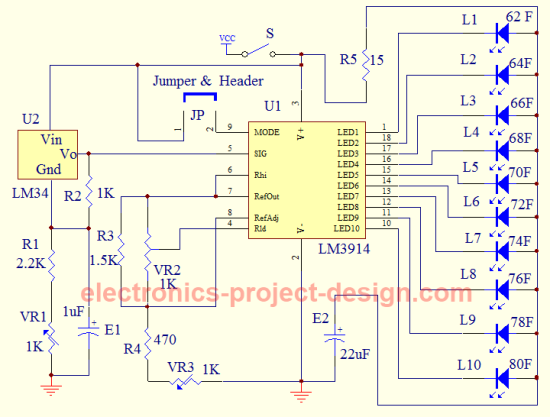 The LM3914 LED driver is used to drive the ten LEDs that will display the temperature of the room. This integrated circuit can be obtained from Texas Instruments or an equivalent part from our store. This objective of this project is to design and build a battery tester that is able to test various types of dry cell and rechargeable battery with a voltage of less than 2V. This project also uses the LM3914 IC to drive the LEDs. This store was established due to the requests from many of our visitors to our website. We strive to meet your needs by bundling many different products. For instance, we have many different values of capacitors, resistors or diodes in one bundle. Please feel free to contact us if you want to see a particular product being listed here. In the meantime, please feel free to browse the many products that are available in this store. We also provide FREE SHIPPING for all products. We have identify some of the electronic related shows in the US, Asia and Europe that you may want to consider visiting. You will be among the first to know the latest electronic trends besides getting valuable contacts during the shows. If you find any of the above information useful, please feel free to forward it to your friends. If a friend forwarded this to you, you may want to subscibe to this newsletter yourself and have future issues sent directly to your mailbox. Please subscribe HERE.